Renault has reportedly decided to take a riskier approach to this weekend's 2017 finale. Out of spare parts at a reliability-marred tail end of the season for the French marque, Renault decided in Brazil to get through the weekend by turning down the engine power. But Auto Motor und Sport claims the power is back up as the season concludes this weekend in Abu Dhabi. That's because it's the last race, with Renault 4 points behind Toro Rosso and just 2 ahead of Haas in the constructors' title standings. Nico Hulkenberg says he is happy with Renault's year overall. "We did what we wanted to do," said the German. 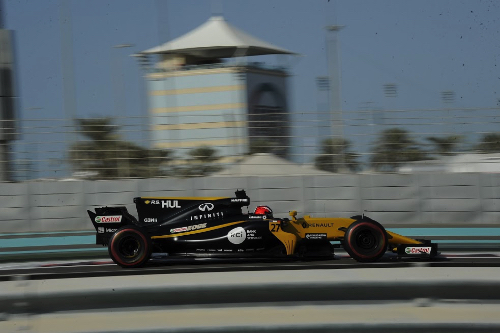 "We started poorly but have caught up a lot," said Hulkenberg. As for that battle for sixth place with Toro Rosso and Haas, Hulkenberg said he is personally not overly interested. "Sixth sounds better than seventh," he said, "but it will not change our lives dramatically. As long as you are not at the front, everything is irrelevant anyway." Hulkenberg says Renault has worked hard in 2017 to build up the team for the future with more people, equipment and better processes. "The winter is not only four months," he said. "We started our course correction a few months ago. A lot has been happening in the background," he said.